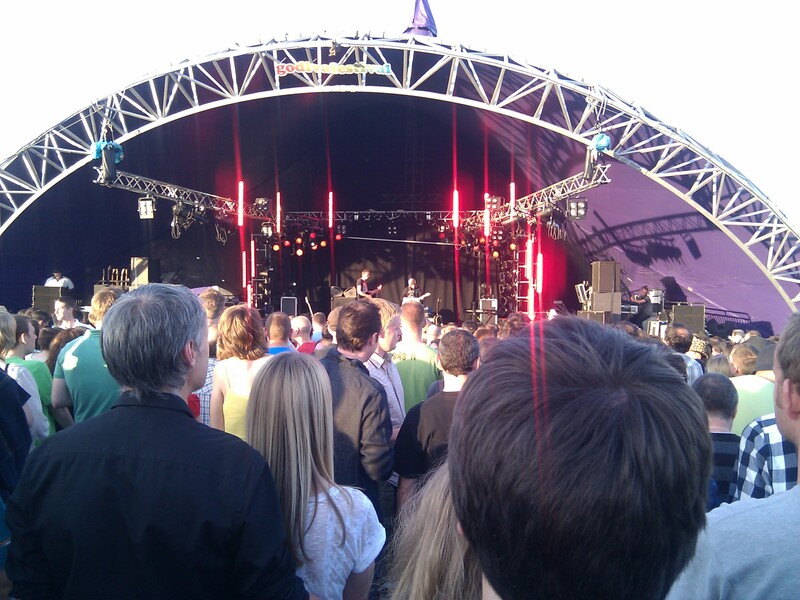 At the weekend I went to the Godiva Festival, twice. Now, in the past I’ve been to it occasionally, and it has been anything ranging from dire to dismal. Last year, admittedly, I wasn’t able to go as I was on holiday in Canada – and I would like to have gone, as Newton Faulkner was playing. This year Badly Drawn Boy, Ash and Joshua Radin were playing, amongst others. I haven’t really heard much Badly Drawn Boy, but he’s famous, and so I thought I should see him play. Joshua Radin is pretty much unknown, but I’ve heard him a fair bit on Spotify and thought he’s definitely worth seeing live. And Ash were one of my favourite bands while I was at university, so there was no chance I was going to miss finally seeing them play live. When I set off from home I knew I would be a little late for seeing the start of Badly Drawn Boy’s set, but what I wasn’t counting on was for them to have moved the car park entrance right round to the other side of the park, and made the diversion go on one of the slowest roads in the area. Also, once I’d got near the parking entrance there was a barrier halfway across the road with a ‘road closed’ sign up. Assuming this meant the car park was now full, I turned round to try and find somewhere else to park. Fortunately I looked in my rear view mirror and saw two cars drive around the barrier and into the entrance, so I turned back around and went into the car park. As I entered, one of the stewards asked me to put my hazard lights on. I did, but it seemed a bit of a strange idea – as if flashing orange lights on your car would make you in any way safer. 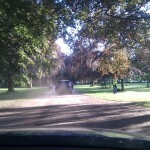 I then proceeded to drive through Memorial Park, along the dusty footpaths, until I found the car parking field. It was then a long walk right over to the other side of the park to the entrance to the main stage area, where there were stewards waving hand-held metal detectors at you. They weren’t particularly good metal detectors, as I remembered just after I’d got through that I still had my penknife in my pocket. When I got to the stage it was about twenty-five past eight, and Badly Drawn Boy was well into his set. I started to look around for people I recognised. I knew Steve was going to be there, so I texted him to ask where he was. He replied that he was just in front of the sound desk tent, which was exactly where I was, so I looked around a bit more, but I couldn’t see him. As I turned back around, Steve appeared in front of me – it turned out he’d been there all along, we just hadn’t realised it until then. Badly Drawn Boy was okay, but nothing special. I didn’t really recognise any of his songs, and most of the time it was just him with a guitar. For a couple of songs another guy came on with an electric guitar and there was a backing drum track, but there was nothing to set the world alight. 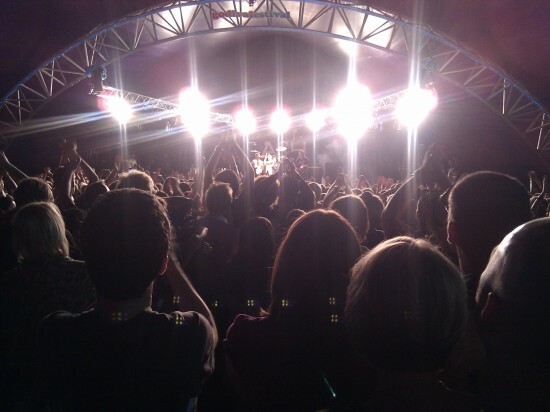 After he had finished there was a wait of about forty minutes before Ash came on stage. I wasn’t sure what to expect from them – after all, the only songs I really knew were from their 1997 album, 1977, so I didn’t know if they would just do lots of new stuff which I wouldn’t recognise. Thankfully, they did a great job of mixing their newer stuff with the old, and I also discovered that I already knew quite a bit of their newer stuff without having realised it. There was a lot of singing-along happening, including during Girl from Mars when the group of guys behind me sang the whole guitar solo too. Which was what I was tempted to do, and probably would have done if I’d been playing the CD in my car. 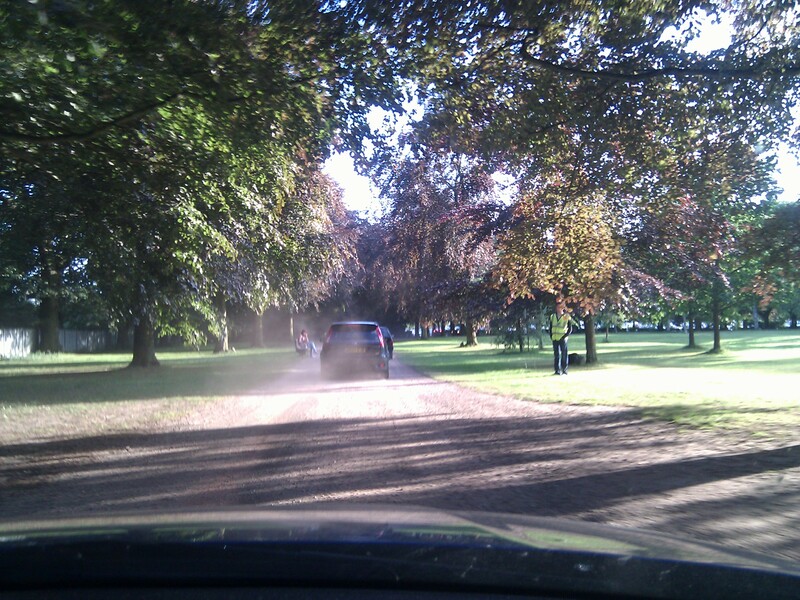 When leaving the park at about half past ten, the stewards again asked me to turn on my hazard lights. I asked why, and they said ‘for safety’. I told them it was okay, as I had headlights, and didn’t turn them on. The car in front did though, and it meant my eyes were constantly adjusting to the brightness as they flashed on and off, and probably made things a lot less safe for any pedestrians wandering around the cars. I’m not completely anti-Health and Safety, but I wish people would think about their health and safety rules instead of blindly implementing silly policies like that. On Sunday Joshua Radin was playing, so Naomi, Joscelyn and I decided to go back to the festival to see him. According to the programme he was supposed to be on at six o’clock. We were a little late (we were going to stay at home because it was starting to rain, but then the skies brightened so we went out), and arrived at the car park at five past six. This time there was no barrier across the road, but when we got to the entrance the steward told us that the car park was closed. 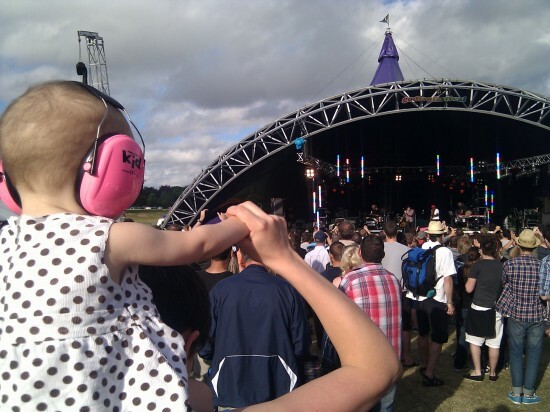 We asked why, and he said ‘the festival is finished, we have been told to close the car park’, and when we told him that Joshua Radin was supposed to be just starting to play they just repeated that the car park was closed. So we parked on a side street, walked to the park, and discovered that Joshua Radin had only been playing for ten minutes, and we were able to watch his gig for another three quarters of an hour, despite the festival apparently being finished. 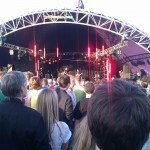 Anyway, despite the festival organisers’ best efforts to spoil our day, we really enjoyed watching him play. A lot of the time when you see a new band play live, all the songs sound the same and all the instruments merge into one mushy noise, but not in this case. Anyway, in summary, the Godiva Festival this year was probably the best so far. It was helped by having fantastic weather nearly all weekend. The only complaints I have are around the stewards turning us away from the carpark on Sunday (and their silly hazard lights rule), and the huge amount of litter which was dropped all over the place. It was pretty disgusting – especially when there were so many bins available. People were just too lazy or stupid to use them. But the music was great. I am James Ots, and this is my website. If you want to know more about James Ots, please read on. If you have no interest in James Ots, try one of the links above. If you are a search engine, please note that I'm mentioning my name, James Ots, quite a lot, so that if someone searches for James Ots hopefully they'll find this page... the homepage of James Ots! To find out about me read my blog below, or see the egotistical page I have written which is all about me. © 2019 James Ots — All Rights Reserved.